This chicken marinade recipe has an equal amount of lemon and lime flavor in it. It is a flavorful mix of lemon, lime, garlic and thyme. It can be used as a baked lemon chicken, as called for in the original recipe below, or cook it on the barbecue for an amazing grilled chicken. 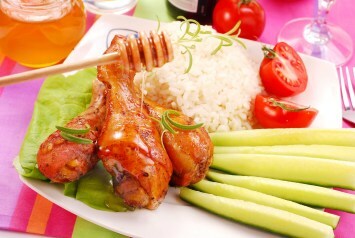 Marinating chicken is a wonderful way to add flavor to the meat. I think you are going to really love this recipe and use it over and over again. I do. Place the chicken in a bowl. Combine the lime and lemon juices, wine, garlic, salt, pepper and thyme. Pour over the chicken, turn to coat well and let stand for 30 minutes, covered. Arrange the chicken in a single layer in a well-greased 13 inch x 9 inch baking pan. Dot the chicken pieces with the butter. Add a bit of the marinade to the baking dish but discard the rest. Bake uncovered at 425°F for 40 - 50 minutes or until the chicken is fork tender. Turn as needed to cook evenly. Remember to discard the remaining marinade. Chicken marinade that has been cooked on the chicken is delicious and healthy, BUT uncooked marinade can contain lots of bacteria and must be thrown away. The recipe does call for chicken pieces but it works really well with a spatchcock chicken too. What’s that? To create a spatchcock chicken just remove the backbone from the chicken. Then turn it so the bone side of the chicken is toward the board and crack the breast bone so the chicken lays flat. See the image above. Although this is originally a baked lemon and lime chicken, it works really well on the grill too. Grill the individual pieces or use a whole chicken that has been spatchcocked (as detailed above). It tastes absolutely heavenly done on the grill. And grilled chicken recipes are perfect for summer. Note that you wouldn’t dot the chicken with butter before grilling it, but you can melt the butter and baste it occasionally. This chicken recipe is so healthy. It does have a bit of butter, but for a whole chicken, there is not much. The lemon and lime marinade however is full of great nutritional value, not just Vitamin C.
This wonderful chicken marinade recipe is perfect if you need low carb recipes, diabetic recipes or gluten free recipes. It suits all of those diets well. 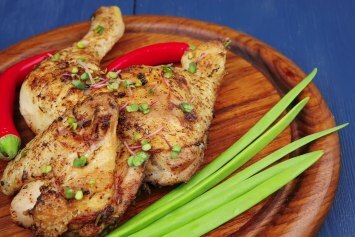 This chicken marinade recipe is just one of our delicious chicken recipes. Browse them all here. If you like this recipe, please take a moment to Pin it to Pinterest, Tweet about it, Like it on Facebook and leave a comment and your favorite chicken recipe below. Thanks a lot.